Many Australians like to travel interstate on holiday. Australia is very diverse, which means that you can experience a variety of different climates and life styles, depending on which area of Australia you go to. For example, the north of Australia, with its tropical climate, is very different to the south with its temperate climate. One of the great places to visit in Australia’s south is our only island state – Tasmania. Australians often call Tasmania ‘Tassie’ for short. In this podcast, I would like to tell you about the ferry journey from mainland Australia to Tassie. Tasmania is just 240 kilometres away from the southern tip of Victoria, across the Bass Strait. However to travel to Tasmania, you normally travel from Melbourne, the capital of Victoria, to Devonport on the north coast of Tasmania. That distance is 429 kilometres. There are two ways to get to Tasmania. The first is by air and the second is by ferry across Bass Strait. By air from Melbourne to Devonport is about 1 hour. If you want to go to Hobart, which is the capital of Tasmania on the east coast, it will take about 1 hour and 15 minutes. Many people, myself included, like to travel on the ferry, because we can bring our car or motorcycle with us. It’s quite cheap and you will then have your own transport in Tasmania. Devonport on Tasmania’s north coast is a great place to start your adventure in Tasmania. My brother and his family live in Tasmania, in a great little town called Ulverstone on the north coast of Tasmania, just 20 kilometres by road from Devonport. He loves motorcycling just like me, so I love to travel on the ferry with my motorcycle to visit him so that we can go riding in Tasmania. The roads and countryside in Tasmania are really beautiful and are just perfect for motorcycling. The roads have lots of curves and are well maintained, and every 30 kilometres or so there is another small town, usually with a bakery and great coffee. Catching the ferry to Tasmania is part of the fun of visiting there. The ferry is called Spirit of Tasmania. Actually, there are 2 identical ferries, one called Spirit of Tasmania 1 and the other called Spirit of Tasmania 2. The ferries carry vehicles, such as trucks, cars, caravans and motorcycles, as well as people. They operate almost every day of the year. While one is sailing from Devonport to Melbourne, the other is sailing from Melbourne to Devonport. They pass one another during the journey. The journey takes around 11 hours and starts at 7.30pm, finishing at 6.30am the next day. During the summer, there are also some trips which leave in the morning and reach the destination in the evening. I have tried one of these trips but I think I prefer to take the evening ferry. That way I can sleep while the ship sails and be ready for a full day when I arrive at my destination. The journey starts when you arrive in your vehicle at the dock. Most people arrive early. We queue up and then wait for the vehicle loading to start. They always put the motorcycles in a queue of their own. This means I can talk with the other motorcyclists while we wait. As usual, we mostly talk about motorcycles and where we are planning to ride. I find motorcyclists are easy people to talk to. When they finally call you on board, we all start our motorcycles and head up the ramp in a long line onto the vehicle decks of the ship. When I first went on the Spirit of Tasmania, I was worried about the safety of my motorcycle, in particular how it would be tied down. In a car, you just put the hand brake on and the car won’t move, even if the ship is rolling with the waves. But I need not have worried. Attached to the deck of the ship on the car decks are hooks every metre or so. When you park your motorcycle, a member of the ship’s crew comes along and attaches two holding straps from the front forks of your motorcycle down to the hooks on the deck. Then they tighten the straps. Now my motorcycle is safely attached and can’t move or fall over, no matter how rough the Bass Strait gets. Next I grab my bag and head up the stairs to find my cabin. I change into some more comfortable clothes and explore the ship. They have some great things on board, including a free movie theatre, two restaurants, bars, a gift shop, lounges where you can enjoy a drink and watch TV, a Tourist Information Centre and a gaming lounge for those who like to gamble. I like to get a drink and relax in one of the TV lounges. Then I go to one of the restaurants and have a great meal. A walk on deck is always a good idea too. I always take my camera and sometimes you can get wonderful pictures of the sunset as the ship leaves Melbourne. Melbourne’s Port Phillip Bay is very large. The ship must sail 77 kilometres before it gets to the entrance of Port Phillip Bay. 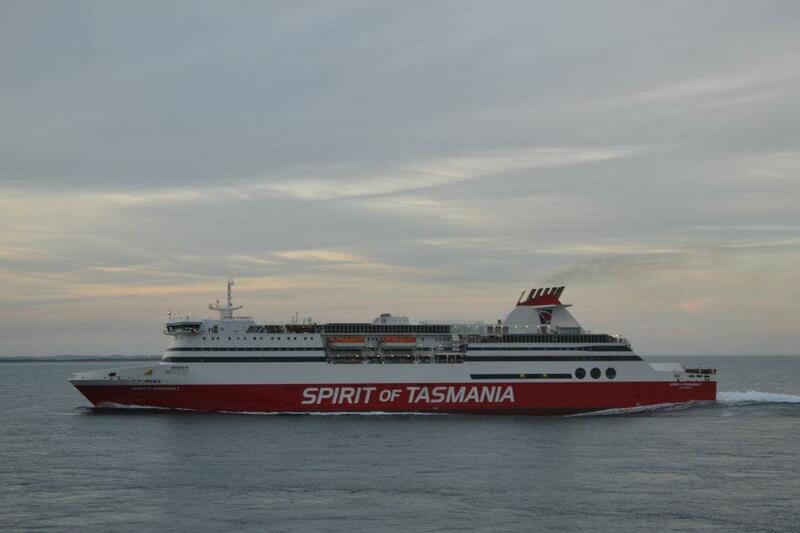 Once it passes through the entrance, the Spirit of Tasmania is on it’s way across Bass Strait. You can feel the difference in the movement of the ship once you are out of the bay. The oceans swells make the ship roll gently, depending on how rough the ocean is. I like to take some medication from the chemist to stop me from getting sea sick, as I am not a very good sailor. That also helps me to sleep, so I go to bed in my cabin around 9.30pm. Before I know it, it is ten minutes to six in the morning and the loud speaker is telling me that I should get up and be ready to disembark at 6.30 am. I have a shower, get dressed and wait in the lounge until we are told we can go to our vehicles. I love riding off the boat into the Tassie sunshine and heading off to meet my brother and his family at their house in Ulverstone. From there, wonderful Tasmania is mine to explore. If you have a question or a comment to make, please leave it by clicking the comments link at the top of this page. Or, you can send me an email at rob@slowenglish.info. I would love to hear from you. Tell me where you live, a little bit about yourself and what you think of my Slow English podcast. I will write back to you, in English of course. Perhaps you could suggest a topic for a future podcast. If you would like to take a short quiz to see if you have understood this podcast, you will also find it on my website. Goodbye until next time. Podcast 30 Quiz - Did you understand the podcast? True or False? – The island of Tasmania is sometimes called ‘Tassie’ by Australians. True or False? – The sea between mainland Australia and Tasmania is called Bass Strait. True or False? – Rob likes to take the ferry to Tasmania because he can take his own transport with him. True or False? – The roads in Tasmania have lots of curves but are not well maintained. True or False? – There are two ferries and they both sail at the same time. True or False? – Rob prefers the evening ferry so that he can sleep while the ferry sails. True or False? – While Rob is waiting in the queue to go onto the ferry, he likes to talk with the car drivers. True or False? – Rob’s motorcycle is safely tied down with 2 straps to the deck of the ship. True or False? – Rob takes his camera with him on the Spirit of Tasmania. True or False? – Rob thinks that the ferry trip is part of the fun in going to Tasmania. Thank you for these wonderful podcasts about Australia. I’ve never been to Australia but I can imagine how lovely it is. I like riding a motor bike, too. Therefore I love to go to the European Alps (Austria, Switzerland, Italy and France). The south of France is also a great area for motorcycling. I’m looking forward to your next podcast. Many thanks for your message. It must be wonderful to be able to ride a motorcycle in the European Alps. The scenery there is extraordinary. I’m so glad that you enjoy my podcasts. Great post Rob. It brings back some wonderful memories of Tassie and of trips past. Well done you!